We deliver throughout Ireland. Delivery is free on all orders (irrespective of value) in the greater Belfast area. Within Northern Ireland, delivery is free for orders over £500, and in the Republic of Ireland free for orders over £1000. Deliveries are normally made by our own two man delivery teams. We place huge emphasis on the quality of our delivery service. 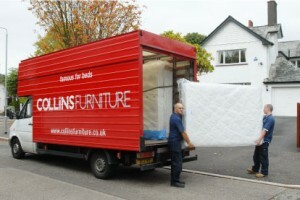 All of our delivery staff have been employed by us for over ten years, and are trained to provide the highest possible standards of care and attention Not alone will they deliver your furniture, they will place it in your room of choice, unpack, assemble, remove all packaging and check it before leaving your house. Customers are always contacted prior to delivery to agree a convenient day and time. If required, on the day our driver can call you in advance, to give you sufficient time to meet him at your home.